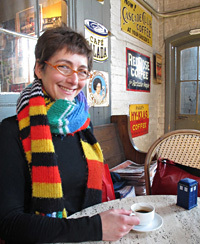 When I was a teenager, I insisted my mother knit me a Doctor Who scarf. Although the colors weren’t precisely right, it was exactly what I wanted: an absurdly long, multicolored scarf with a generous fringe. I wore it for years. And years. I was still wearing it when I finished university and started my first proper	job. 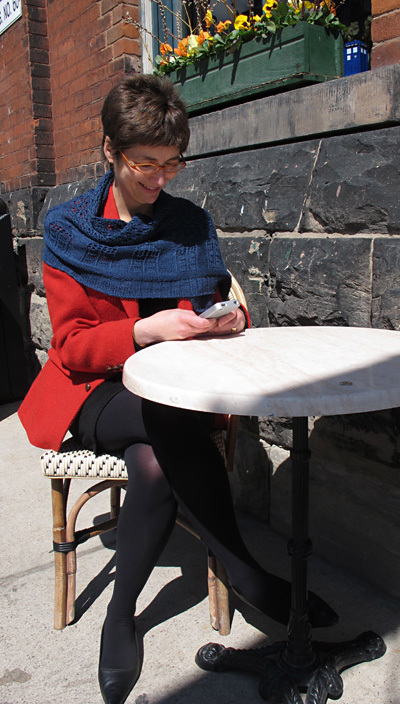 Editor's note: this brand-new colorway, created just for this project by the great women at Lorna's Laces, will soon be available at Eat Sleep Knit and Jimmy Beans Wool. Or contact your favorite LYS and ask them to order it for you! M1: Make a backwards loop and place it on the right needle. C2R: On RS, skip first st, and knit into front of second st, leaving both sts on left needle. Knit first st and slip both off needle. On WS, skip first st, and purl into front of second st, leaving both sts on left needle. Purl first st and slip both off needle. 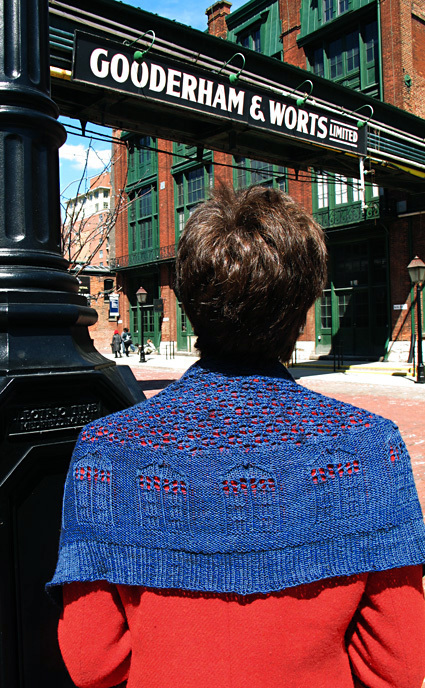 C2L: On RS, skip first st, and knit into the back of second st, leaving both sts on left needle. Knit first st and slip both off needle. On WS, skip first st and purl into the back of second st, leaving both sts on left needle. Purl first st and slip both off needle. Make bobble: (K1, yo, k1) into the next st, turn. P3, turn. CDD. CDD [Central Double Decrease]: Slip 2 sts together as if to k2tog, k1, pass the 2 slipped sts over the stitch just knit. Row 1 [WS]: Kfb. 2 sts. 1 st increased. Row 3 [WS]: K1, kfb. 3 sts. 1 st increased. Row 5 [WS]: K2, kfb. 4 sts. 1 st increased. Row 7 [WS]: K2, p1, kfb. 5 sts. 1 st increased. Row 9 [WS]: K2, p3. Row 10 [RS]: K2, yo, k1, yo, k2. 7 sts. 2 sts increased. Row 11 [WS]: K2, p to end. Row 12 [RS]: K3, yo, k1, yo, k to end. 9 sts. 2 sts increased. Row 13 [WS]: K2, p6, m1, p1. 10 sts. 1 st increased. 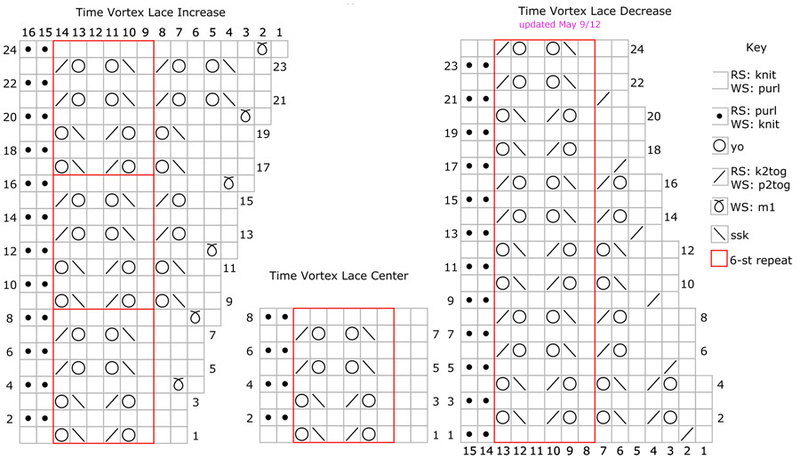 Starting with a RS row, work rows 1 to 24 of the Time Vortex Lace Increase chart 7 times until there are 52 sts, incorporating an additional horizontal repeat after each vertical repeat. Starting with a RS row, work rows 1 to 8 of the Time Vortex Lace Center chart 3 times, working the 6-st repeat 8 times across row. Work Rows 1 to 7 once more, ending on a RS row (31 rows total). Starting on a WS row, work rows 1 to 24 of the Time Vortex Lace Decrease chart 7 times until 9 sts remain, removing repeats of the 6-st pattern across row as st count decreases. Row 1 [WS]: K2, p to last 3 sts, p2tog, p1. 9 sts. 1 st decreased. Rows 3 to 10: Repeat the last 2 rows until 4 sts rem. 4 sts decreased. Row 11 [WS]: K2, p2tog. 3 sts. 1 st decreased. Row 12 [RS]: K2tog, k1. 2 sts. 1 st decreased. Row 13 [WS]: K2tog. 1 st. 1 st decreased. Cut yarn and pull through final st to secure. 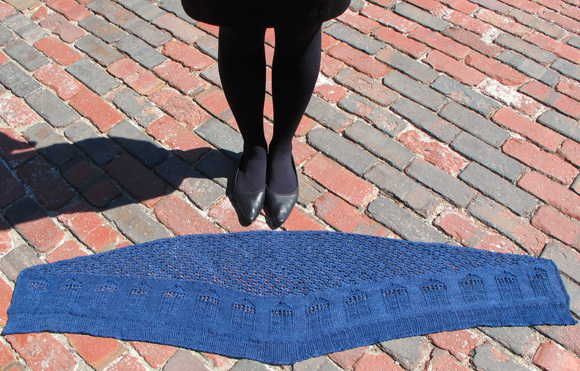 With RS facing, rejoin yarn and pick up and knit 311 sts evenly distributed along the right (curved) edge of lace section. 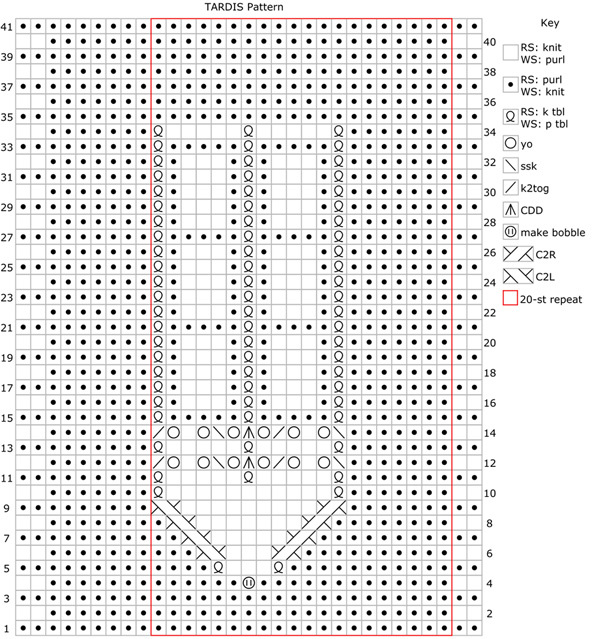 Starting on WS, work rows 1 to 41 of TARDIS chart, repeating sts in red box 15 times in total across each row. Ribbing row 1 [RS]: K3, [p1, k3] to end. Ribbing row 2 [WS]: P3, [k1, p3] to end. 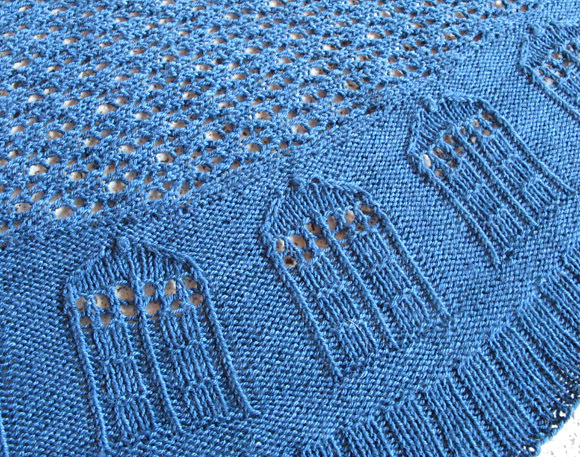 Work ribbing as set until ribbing measures 2 inches, ending with a WS row. Bind off as follows: K2, *insert tip of left needle into the front of these two sts (from left to right, as if to SSK), and knit them together; k1, repeat from * to end. Cut yarn and pull through final st to secure. Block and weave in ends. 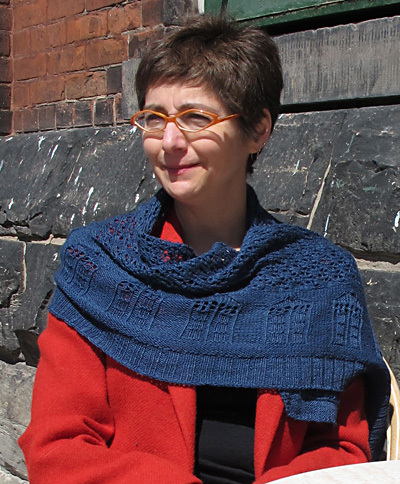 Kate is Knitty’s Tech Editor, and her favorite Doctors are Ten and Four. And yes, that's the original scarf in her headshot.